Early morning at the YMCA in Amherst and already a dozen people are on the gym floor, working up a sweat playing pickleball. Just as many stand on the sidelines waiting their turn. Never heard of pickleball? You will. It’s like tennis, but is played on a badminton-size court. Players use oversize pingpong paddles to knock around what looks like a wiffle ball. And despite its goofy name, pickleball is billed as one of the fastest-growing sports in America. Its popularity is highest among seniors, whose zest for the game is cultivated in retirement havens like Florida, then brought back home by the snowbirds. In fact, demand for space to play pickleball prodded the Town of Amherst to start a program last fall at the Clearfield Recreation Center. During the summer, unused ice rinks in West Seneca and East Aurora are striped for pickleball. Upgrades to the tennis courts on State Street in the City of Tonawanda were planned with pickleball in mind. In August, a huge pickleball tournament is scheduled at Buffalo RiverWorks. It was 3½ years ago when Voisinet, 75, a retired Niagara County Community College professor, organized one of the area’s first regularly scheduled pickleball games at the Third Warders Club in North Tonawanda. He now helps promote the sport as New York State director of the USA Pickleball Association. While the game has caught on only recently, pickleball actually marked its 50th anniversary this year. It was invented near Seattle in 1965 by three dads trying to entertain their bored kids, according to the Pickleball Association. There is some question about the origin of the sport’s unusual name, but it’s thought to come from one of the inventors’ dog, “Pickles,” who liked to run after the balls and hide them in bushes. More pickleball players than usual showed up at the YMCA’s Independent Health Family Branch in Amherst on a recent morning, as the snowbirds have started returning from their winter in Florida. Three courts were set up in the gym. The players partnered and played doubles. “When the game starts, it’s an underhand serve,” explained Coley Felser, one of the players. Felser, a retired physical education teacher from Buffalo, went on to explain how the ball is served diagonally, and each side must let it bounce once before there’s a volley. There’s a no-volley zone on each side of the net to avoid spiking. Points are scored only by the server, who continues until he hits the ball out of bounds or it doesn’t clear the net. “It’s more pingpong than anything,” said Felser, 72. The YMCAs in Amherst and West Seneca are now among some two dozen places to find a pickleball game across the region, said pickleballer Jason Santerre of West Seneca. Games are breaking out wherever there’s available space – tennis clubs, school gymnasiums, church rec centers. And not everyone playing is a senior citizen. Santerre, 42, was online looking for ways to teach his kids tennis, when he came across a video on pickleball. He was hooked. So Santerre bought the domain name Buffalopickleball.com, started a group and used the gym of the First Baptist Church on Union Road, West Seneca, to set up four courts. That was three years ago. These days, as many as 60 people have shown up on Tuesday nights for spirited games of pickleball, he said. In East Aurora, Tracy Gavin organizes Thursday night and Saturday morning games of pickleball at the Boys & Girls Club on Paine Street. The games draw as many as 45 people from as far away as the Albion area, she said. The sport was a welcome release during the long, cold winter. The first to score 11 wins the pickleball game, but at the Y in Amherst they play to seven to keep things moving. After all, the players need to take down two of the nets by 9 a.m., when they share the gym with the Zumba class. A few of the pickleballers here had been onlookers who pressed their noses against the gym window in curiosity and only recently joined the game. Others have been playing for a couple years. Judy Bryant, 64, of Amherst, hadn’t touched a tennis racket in 30 years before being introduced to pickleball in Florida. Sandy Mendel, 63, of Amherst, once played badminton competitively before tearing her ACL. The two met playing pickleball, clicked and are now pickleball partners practicing for the Empire State Senior Games in June. 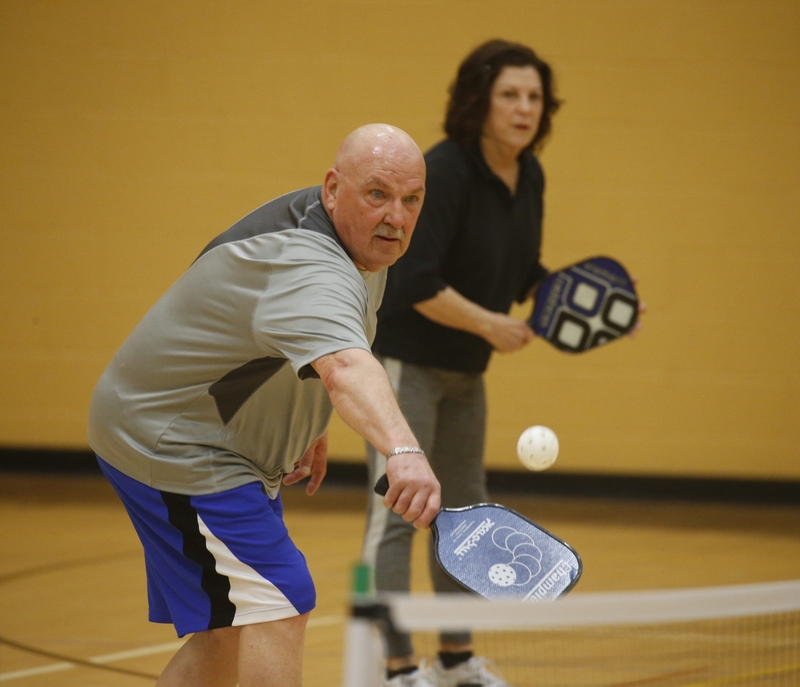 There are more than a few knee surgeries and hip replacements among these aging athletes, but they manage on the pickleball court. A few laughed about the time the old guys handled the young college kid who stopped in to play.